Over the years, a modest leisure park has taken shape on this site along the IJsselmeer dam. Several small museums cluster round the shipyard where a replica of the 17th-century vessel 'Batavia' was built. 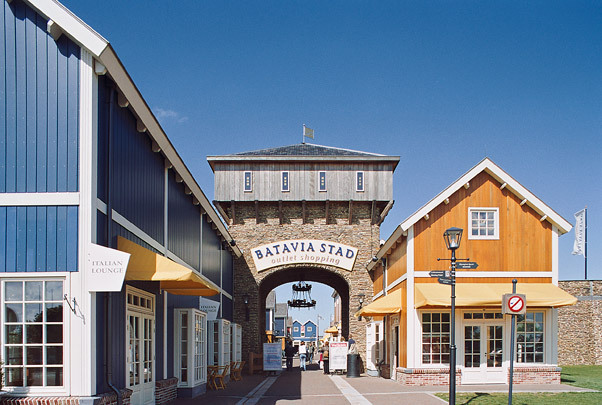 The most remarkable component on site is Batavia Stad, an outlet shopping village. Designed as a reconstructed fortified town, it has a massive town wall, three town gates, car-free cobbled streets and a string of individual wooden shop buildings with a mock-authentic architectural air about them, part Marken island style and part colonial architecture from the Caribbean, from where the original 'Batavia' used to return fully laden.